Chula's mom is a nice lady named, Sheron Long, and Mrs. Long has written a book called, Dog Trots Globe. 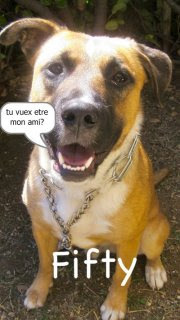 It's about France... but through Chula's eyes. So I'm pretty sure Chula helped out a little bit (or a whole lot!). In Dog Trots Globe, Chula explores all over Paris and my lavender, stomping grounds... Provence! It's full of loads of beautiful photos of France (more than 150 beautiful photos of the Eiffel Tower, the Seine, and those Provencal markets my mommy likes so much and loads of other ones too). Plus there are loads of tips in case you want to come to France and bring your dog too (dogs are THE best travelling buddies if you ask me and I'll let you in a little secret... French people love dogs... we're welcome almost anywhere). If you want to win your very own autographed copy of Chula's beautiful book (that also comes with lots of fun online extras including four videos of France), here's how you do it... you must be a follower of my mommy's blog and leave a comment to let her know that you are. It's that simple! For extra entries you can do any or all of the following... but be sure to leave a comment for each! 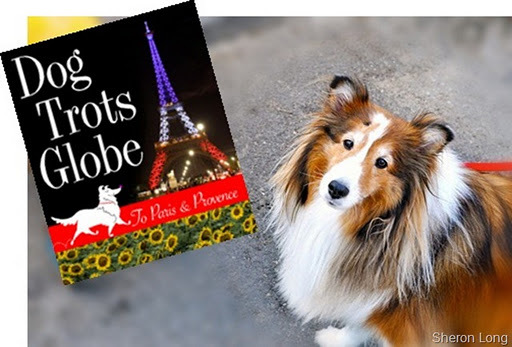 And if you want to buy Dog Trots Globe you can here, on Amazon, or the Apple iBookstore. Voila... you have five chances to win. The winner will be drawn Monday, 19th December. What a cute concept for a book! I did all of the above (already a fan/friend of some of them)! Love your new facebook page Fifty, although, now my cats are jealous. Thanks Fifty; looks like a great book. You should write a book about your French life too! Just liked your Facebook page. and have sent a friend request to Chula, phew I think that is all! Have a good Christmas. I also like you and your mom's blog on Facebook. Thanks! I follow your mum's blog. Fifty, do you think you could have a chat to the dogs in our village? And tell them to stop pooing on the footpath right outside the maternelle school. It's driving me batsh*t. Merci! And folllowing on fbook as well! Thanks for the giveaway. And now the FB page is liked as well! And I hope Chula accepts my FB friend request! True story: My very first dog was named Chula. I'm a follower of the blog!! Love the dispatches from France!! Such a fun post :) loving your blog &happy I stumbled across it! So adorable. I just became a follower of the blog. how precious! i'd love this. If you'd like to win 5 shirts from Stylemint, please enter my giveaway! You know what a crazy dog lady I am. So of course, I had to enter this fun give away. Chulua reminds me of the collie I had growing up...pretty pretty, keep Fifty away! It's so true about the French and dogs, I know Brits love their dogs too but the French doggies get into to all of the best places!